I will be buying a cherry/walnut gloss bedroom suite soon - what colors should I paint my bedroom to go with this cherry/walnut color? I do like the colors lavendar and gray but that was before I chose this bedroom suite and I'm not sure if they would be a good choice now. Would those colors look OK? I think you would be well advised to have a look at the Behr Color Smart tool which shows you how groups of colors work together. I started by choosing the 'orange' family of colors (as, rather oddly, there is no 'brown') and used the 'Fine Tune' option (lighter, darker, add more red etc.) until I got what I think is something like the color of your bedroom suite - Rodeo Red. It then offered me a number of suggestions for colors which would coordinate well with this color. One of the options is shown above although there were others which would possibly be more to your liking and I am sure you will be able to start with a better match to your furniture than the Rodeo Red I used. This is a really useful tool and I am sure you will find it easy to use. Personally, I don't think lavendar or gray would look right with this bedroom suite. 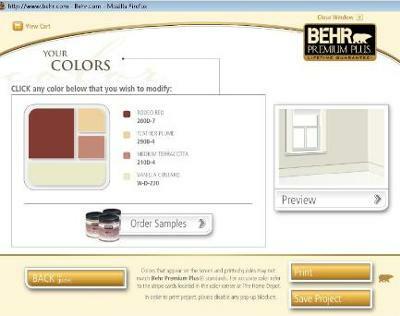 I always use the Behr Color Smart tool when I am decorating. It often throws up color combinations I would never have thought of but really like.